Adela Fonts (Barcelona, Spain) on 3 April 2019 in Miscellaneous and Portfolio. Je ne vois pas les balais..... mais le titre laisse imaginer ! @Gérard Flayol: Les sorcières sont parmi les nuages...!!! @kerrfoa: Oui! C'est vrai Kerrfoa... Merci de tes mots! @Tomix: Un grand merci Tomix! @Libouton Martine: Un grand merci! Very interesting light and color. @STEED: I remember this night of witches. 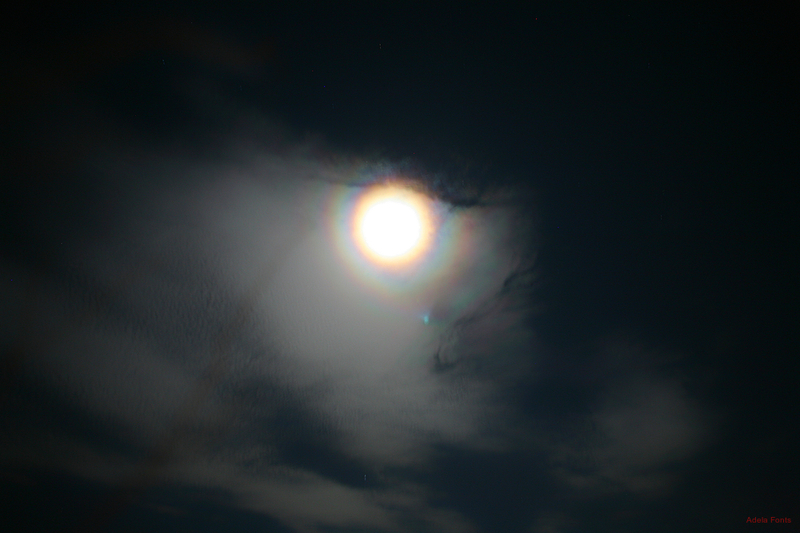 The sky full of black clouds and the moon wrapped in a special halo. For me one night with a magic sky. Thanks a lot! Hugs to you dear friend! A moody and mysterious atmosphere captured here! Je m'attends à voir passer une sorcière sur son balai ;-) belle ambiance Adela ! Beautiful...soon we might see witches on brooms flitting across!!!! I can almost imagine them about to fly on their broomsticks across the moon and its colour prisms. Excellent image and title. It definitely has that feeling! A great image!